Doug Berry has practiced family law for 35 years. 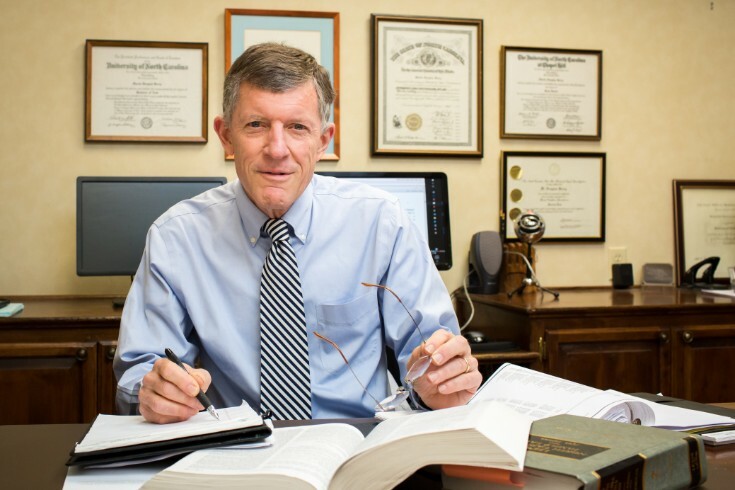 He became a NC State Bar Board Certified Family Law Specialist in 1989, the first year that North Carolina offered specialization certification. Doug has served on the NC Bar Family Law Specialization Committee and the NC Bar Association Family Law Council. Doug is a native of Greensboro, North Carolina. He attended the University of North Carolina at Chapel Hill on a Morehead Scholarship and graduated with a Bachelor of Arts degree in Political Science in 1971. He then attended law school at the University of North Carolina at Chapel Hill, where he acquired his Juris Doctor degree in 1975 and was selected as a national member of the Order of Barristers. He was a member of the North Carolina National Guard from 1971 to 1977. Doug's practice is primarily in the area of family law, which includes separations and divorces, child custody disputes, child support, alimony, equitable distribution/property divisions and adoptions. Doug is certified by the North Carolina State Bar as a specialist in the field of family law. He is a member of the Family Law Section of the American Bar, North Carolina Bar, and Greensboro Bar Associations.